Thanks for your lovely email today. So glad you spent time with Brian and Jane…Funny but I have no memory of the Women and Labour Conference in (Brisbane in) 1984 but, as it happens, the below is something I wrote back in 2016 for a project by “Barbara Cleveland”. I was responding to their questions. It’s quite detailed so may well answer your needs too. Nancy Underhill was definitely the linchpin for bringing Lucy to Brisbane in 1982. Diana Baker Smith and Kelly Doley: Where were you in 1982 (and 75) when Lucy Lippard visited Australia? Barbara Campbell: In 1975 I was busy being an insolent teenager, attending boarding school in Brisbane. I had next-to-zero awareness of the outside world. However the previous year I’d been taken on a day excursion by my Aunt Pam to see “Blue Poles” at Brisbane City Hall on its national tour of the capital cities thanks to Gough Whitlam’s cultural largesse. It was a searing moment (figuratively and literally given the Brisbane heat) and would become the narrative heart of one of my first performances, The Seduction of Art, 1982, co-performed with my partner at the time Ted Riggs. 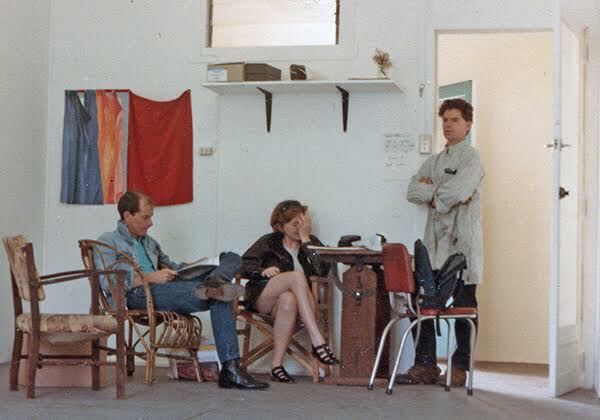 By 1982, I’d finished by first undergraduate art school degree (where neither the words Feminism nor Performance Art were breathed), at what was then Seven Hills TAFE (now Qld College of Art, Griffith University). 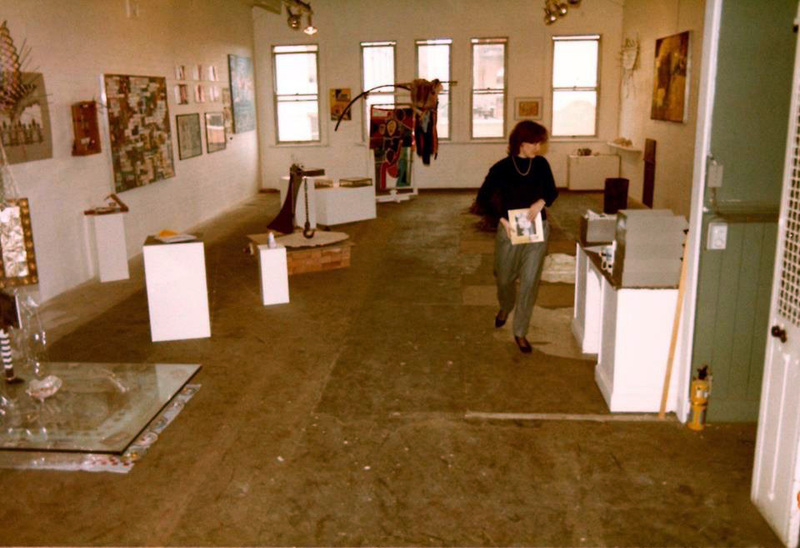 In 1982 I had my first job “in the art world” as part-time gallery co-ordinator of the Institute of Modern Art. The IMA was in pretty difficult financial straits at that time and had just changed its operating model from full time Director/curator to part-time co-ordinator (me) and a program of guest-curated exhibitions and ancillary program of talks, workshops, reading and film groups, performances etc that I co-ordinated. Without a Director at the helm, the board of the IMA was more hands-on in terms of program direction, suggesting curators and speakers and sometimes curating or feeding-in to the program more directly. One of the more active board members was Dr Nancy Underhill, the Foundation Head of the Department of Fine Arts at the University of Queensland and inaugural director of the Art Museum there. I began a B.A. there in 1983. Smith & Doley: What do you know about Lippard’s visit? Barbara Campbell: New York-born, with degrees from Bryn Mawr, the Courtauld Institute and Melbourne University, Nancy had a lot of art world and art history contacts in the anglophone world. One of these was Lucy Lippard and I suspect it was Nancy who brought Lucy to Brisbane in 1982. My impression was that Lucy was based at the University for a few months. Perhaps she was working on a book project, I don’t know. Brisbane had a very small art community at that time. It couldn’t afford to have sequestered clubs like artist, academic, writer, designer as each would have had a membership of five at most. Paths intersected all the time and visitors were avidly welcomed. In 1982 Lucy was one such international visitor. 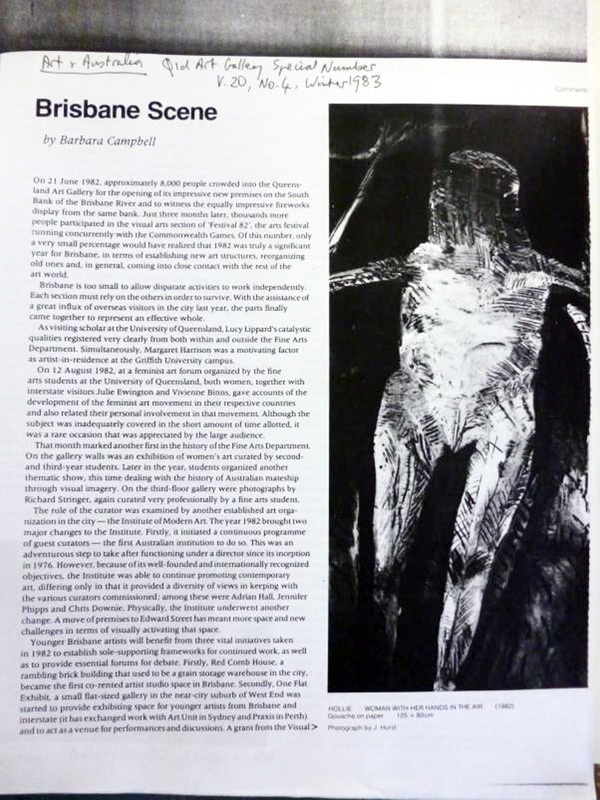 See the attached “Brisbane Scene” column written by me for Art and Australia’s special Qld edition of Winter 1983 where I name her and others. I say in that article, “On 12 August 1982, at a feminist art forum organised by the fine arts students at the University of Queensland, both women [Lucy Lippard and artist Margaret Harrison], together with interstate visitors Julie Ewington and Vivienne Binns, gave accounts of the development of the feminist art movement in their respective countries and also related their personal involvement in that movement. Although the subject was inadequately covered in the short amount of time allotted, it was a rare occasion that was appreciated by the large audience”. How large, I don’t know, and I assume I was there although weirdly, I have no recollection of attending. Other encounters with Lucy I certainly do remember. I think the first was on the verandah of Nancy’s house where she and her husband Peter, a Family Court judge, were hosting a reception for Lucy and other visitors. Under the influence of youth, awe, bravado and alcohol, I remember throwing a question to Lucy, “Why do you think so many US women performance artists are also Jewish?” Lucy, not surprisingly, called my bluff, though in the friendliest way, saying “Oh really? I hadn’t noticed that. Who are you thinking of?” Panicked, all I could do was double-bluff, recalling one real person and then augmenting with fictitious ones, “Oh, you know, Rachel Rosenthal, ….. Goldstein, …….. Bloomberg…..” Lucy, bless her, ended this topic with “Well of course I know Rachel, but those others I don’t know. I’ll look into it”. For me now, this raises the obvious question, Was Barbara Cleveland also Jewish? On another occasion during her stay, my partner Ted and I invited her to dinner at our place. My older brother Richard was also sharing with us at the time. He had no knowledge of Lucy’s “importance” and I knew he didn’t know, so I was mortally embarrassed by the seeming banality of his conversation. Lucy had no such feeling, and probably enjoyed the normality of it. Mostly, I remember her graciousness as a dinner guest. Smith & Doley: What kind of impact did her visit have? Barbara Campbell: The third encounter I can recall was definitely the most impactful for me. Fresh out of art school, I was only just starting to find out what kind of artist I might be. I was already disillusioned with the consumerism of object-making and was beginning to make what we would now call performances but then I might have called actions. Anyway, during Lucy’s stay, I was preparing to present my second batch of performances in public at an artist-curated night in downtown Edward Street. A couple of the works was solo, and another was again with my partner Ted Riggs. It was a very simple though intense scenario where Ted wore highly reflective wraparound sunglasses, we sat facing each other very close, and I simply made up my face using his sunglasses as my mirror. Ted was quite an intense human being so that helped hold the duration. Amazingly, Lucy was in the audience that night, presumably with Nancy. She made some comment about the work afterwards to Ted and me in the foyer. I really can’t remember the substance. It was more the fact that someone like Lucy was taking us, this little event, and Brisbane seriously. This was the impact. Her presence gave me courage to go on. This stuff we were doing in this little place was worthwhile. It was worth doing. She wasn’t the only person to give me that courage but her sheer authoritative presence added to the critical mass.